I have been having a great time this new school year with my Sunday School class. This September we focused on the bible stories in Genesis, the first week we did a wonderful lesson on Creation with a mini book craft and story sequence cards. 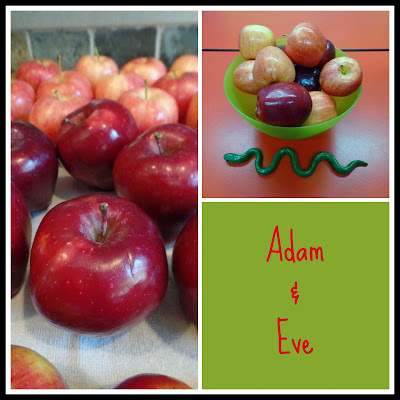 The next week was the story of Adam and Eve. 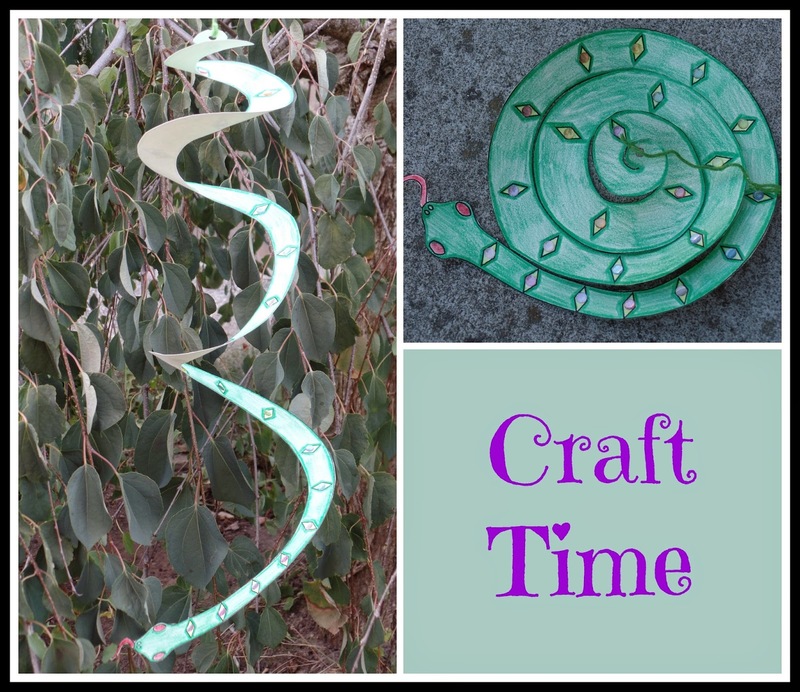 For craft time I decided we would make this spiral snake, I found the pattern for the snake from a Pinterest link here. I printed it out on cardstock. I let the kids color it and then found some cute stick on gems to give the snake some sparkle, and we hung it by some yarn tied through a hole punched in the tail. Having fun crafts like this helps the kids to remember the story better as well as share about the story with their family. I also make sure and explain to the children that we really don't know what fruit it was on the Tree of Knowledge of Good and Evil, and the apple is just an example of a tasty looking tree fruit, kids are often concerned about that after they hear the story. For snack time we enjoyed applesauce cups, mini apple juice boxes, with our crackers, and they each got to take home an apple from the bowl in the center of our table, which they were all very excited about. 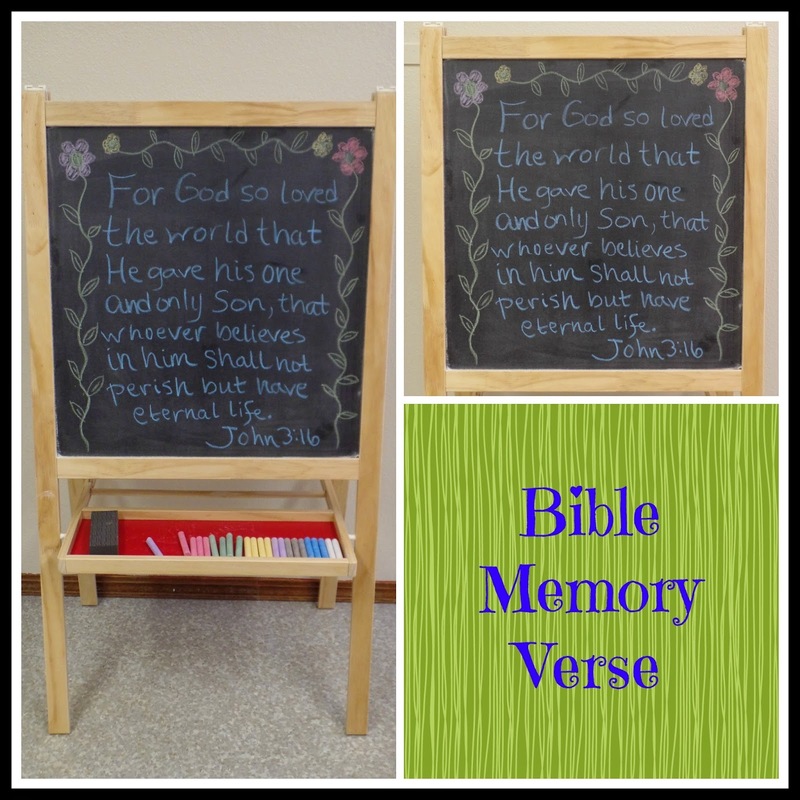 Lately I have been using this cute little chalk board that I found for a very reasonable price at Ikea to display our memory verse. Unless the verse is very simple I like to have the same memory verse for a couple of weeks, that way the kids have a better chance at retaining it. This verse ties our lesson to the basic Bible truth that we all have sinned and need Jesus as our savior. The following week I presented the story of Cain and Abel. I hadn't taught this story in quite some time, I sometimes shy away from teaching the more macabre stories in the Bible, Cain and Abel of course being one of those stories. There were lots of great ideas online though, so I decided to give it a go. Many teachers presented the story using story props of Cain and Abel's sacrifices, so I decided to make cardboard alters to put in the center of our table. I just covered two small cardboard boxes in black construction paper and made red construction paper flames for around the box. When my students arrived the two alters were in the center of the table and they all started guessing what our story could be, they had some great guesses, some thought maybe it was Moses' burning bush, others thought maybe the remnants of a fallen city, which I thought were pretty great guesses considering how young they are, and finally one guessed they were alters. 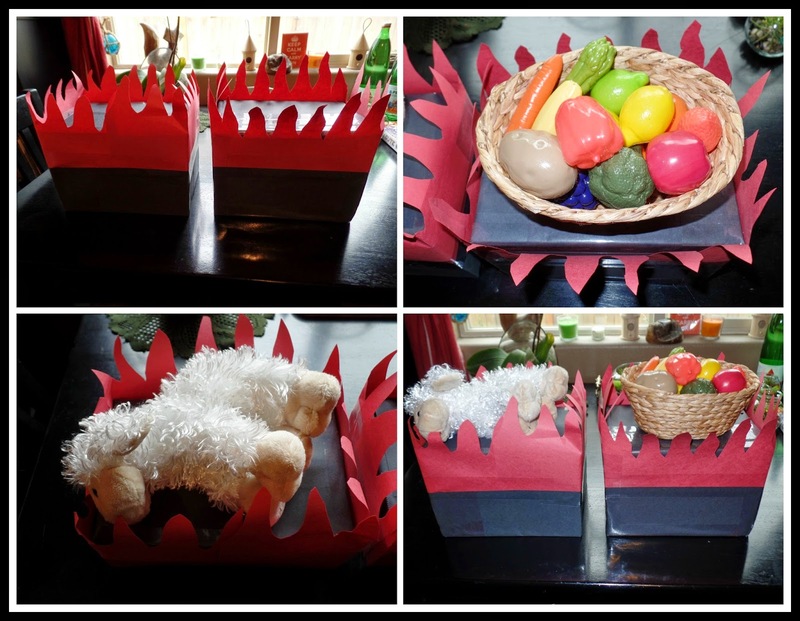 As I told the story of Cain and Abel found in Genesis 4, I set the lamb on the alter representing Abel's firstborn of his flock sacrifice, and then set down the basket of produce for Cain's sacrifice. These story props really helped to engage the children during story time, and helped me to tell a more difficult story. We had a nice discussion about having the right attitude when giving, and also about jealousy in regards to Cain feeling jealous about God favoring Abel's sacrifice. Then again tied the lesson in to our memory verse For all have sinned and fall short of the glory of God. Romans 3:23. Our class was shorter this Sunday for fellowship time, so we didn't have time for an involved craft, but I had some color pages available as well as a printout of our memory verse and stickers and stamps to decorate it with. So that is what we've been up to so far, last week I just finished up a very fun Noah's Ark Craft that I am excited to share about next week. For more of my Simply Sunday School ideas visit the link below.